Syed Ali Hasan Naqvi is currently Senior General Manager (Marketing) at the DAWN Media Group, overseeing all marketing functions for the groups publications, including the daily DAWN, Pakistan’s largest English-daily, Herald monthly, Aurora monthly and Dawn.com. A veteran with over 20 years of experience in the print media field, he has held a number of important positions in its representative body, the All Pakistan Newspapers Society, where he is currently serving as Chairman of the Advertising Committee. Naqvi has also played a key role in conceptualizing and executing a number of the DAWN Media Group’s exhibitions, including the DAWN Education Expo, Pakistan’s first and largest education exhibition, All About Lifestyles and conferences on various sectors. He has also been instrumental in introducing Country and Industry Trade Reports to DAWN’s repertoire. Naqvi is also a Visiting Lecturer at Greenwich University, where he teaches in the Department of Business Administration. 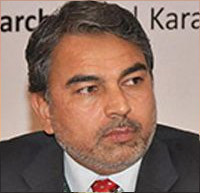 He holds an MA in Political Science from Karachi University and an MBA in Marketing from Greenwich University.